Today I wanted to give you an update on FreedomPop. First, I wanted to tell you that I confirmed with FreedomPop support that you cannot activate Apple’s iMessage service with your FreedomPop phone number. I contacted their support department and they confirmed that this is not possible because FreedomPop uses “virtual” phone numbers. I speculated this was the case in my review and I have now confirmed it. This means while you can use iMessage with FreedomPop service, you’ll only be able to send and receive iMessages from other iPhone users if they send them to the email address you used for your iCloud account. If they send them to your phone number they will be send as SMS text messages, MMS picture messages, or group texts. If you use the affiliate link below when you sign up for FreedomPop you’ll be helping to support smartphonematters.com at no additional cost to you. FreedomPop has two articles on freedompop.com about iMessage. The first article How to use iMessage does say “Calls and text will come from your iCloud account and not your FreedomPop phone number.”, but I think they should be even more clear so that iPhone users understand. The second article, Turn iMessages ON, explains how to turn on iMessage and their screenshots show an activated phone number, not an email address which I think is confusing. 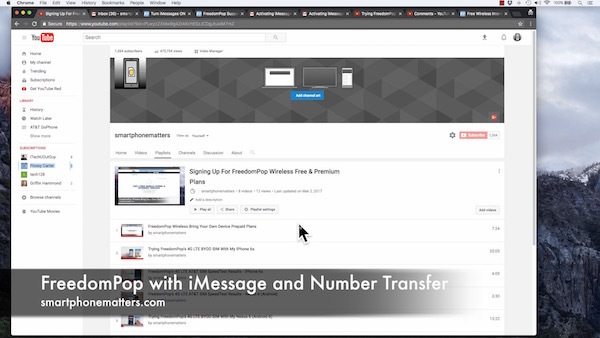 Next, I wanted to talk about transferring you number to FreedomPop. YouTuber Max, asked me if he should cancel his AT&T service before transferring to FreedomPop. If you want to keep your phone number you should never cancel your current phone service before transferring your number. When you transfer your number, your old account will be terminated when the number transfer is completed. You can sign up for FreedomPop first, put the SIM in your phone and try it out. If you decide you want to keep using FreedomPop you can transfer your number. After that, account would be canceled. If you don’t like FreedomPop you can just put your AT&T SIM back in your phone and use it. You can transfer your number from your freedompop.com account. FreedomPop will charge your $10 to transfer your number. Most other services will do this for free. But with FreedomPop your getting a free service so they need to charge you at some point for something. How can I use iMessage if I’m unable to activate it without a real phone number? I can’t seem to find an answer to this anywhere. It just says unable to activate iMessage/FaceTime… Waiting for activation. I understand it would only be used with Apple ID usernames, and not phone numbers, but without the ability to activate, how to do you even do that? If I recall it just worked. Have you tried it? it should be the same as using iMessage with WiFi only on your device. Thanks for the useful information about iMeassge, I had that problem too, but they do not even know how to explain to me! Glad it helped. It is confusing.